Can you confirm these amateur observations of Namibiana occidentalis? Type locality: Keetmanshoop, Great Namaqualand, South West Africa. Diagnosis Diagnosis. Species of Namibiana have 14 midbody scale rows, 10–12 midtail scale rows, 241–387 middorsal scale rows, 12–41 subcaudals, 1–2 supralabials, anterior supralabial absent or small scale present, 192–322 mm maximum adult total length, a body shape of 45–142 (total length/width), a relative tail length of 4.1–10.8 %, a tail shape of 3.8–7.8, no striped pattern, and usually a brown dorsum and pale brown venter (Table 2). Members of Namibiana can be distinguished from the other genus in the Tribe Leptotyphlopini (Leptotyphlops) by having a semilunate (rather than heart-shaped or subtriangular) cloacal shield (except N. gracilior), a higher number (on average) of middorsal scales (241–387 versus 171–322), and a more attenuate body shape (ratio of total length divided by width at midbody, 45–142 versus 36–106). 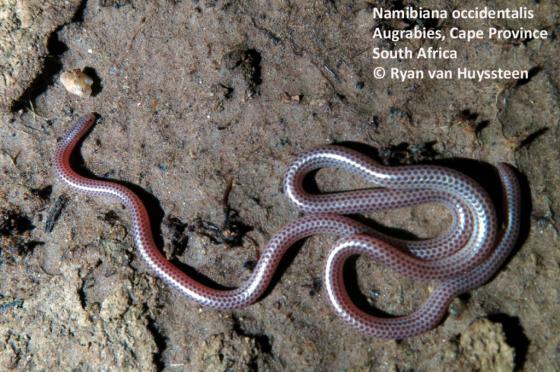 Namibiana occidentalis, reaching a total length of 322 mm (Bauer 1988), is the largest member of the Leptotyphlopinae. Only one species was included in the molecular phylogenetic analyses (Figs. 3–4). [from Adalsteinsson et al. 2009]. Comment Type species: Leptotyphlops occidentalis FITZSIMONS 1962 is the type species of the genus Namibiana Hedges, Adalsteinsson, & Branch in Adalsteinsson et al. 2009. Synonymy: Kaiser et al. 2013 considered the generic name Wilsontyphlops Hoser 2012 invalid and rejected its use instead of Namibiana. Etymology Etymology (genus): The generic name is a feminine noun derived from the name (Namib) given to that region of southwest Africa by the indigenous people (the Nama), used in allusion to the distribution of species in this genus. Branch,W.R. 1988. Field Guide to the snakes and other reptiles of southern Africa. Struik Publishers, Cape Town, 328 pp. Mertens, R. 1971. Die Herpetofauna Südwest-Afrikas. Senck. Naturf. Gesell., Frankfurt am Main, Abhandl. 529: 110 pp.